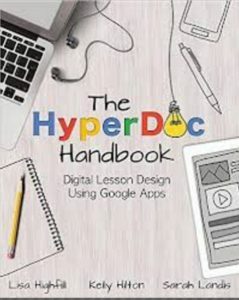 Recently, in a Twitter chat, I was introduced to hyperdocs: cool, interactive Google documents or slides that teachers can use to organize their lessons for students. In a hyperdoc, students click on hyperlinks to go to instructions, activities, videos, or apps like Padlet or Wordle to complete mini-lessons that tie back to an overall theme. 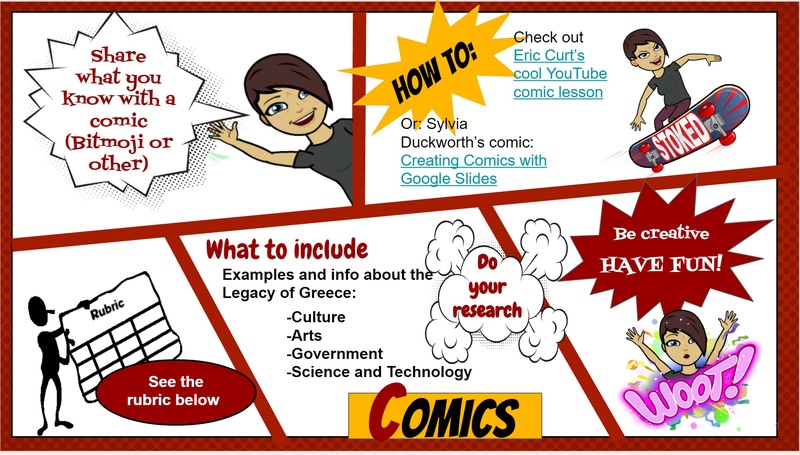 Teacher and blogger Heather Marshall has written several in-depth blog posts for educators about hyperdocs, and she recently posted her Slides Gameboard, an amazing hyperdoc lesson about how to use Google. At first glance, it seemed like hyperdocs would arouse curiosity and be fun to play with — and they also seemed like a great way to individualize learning. 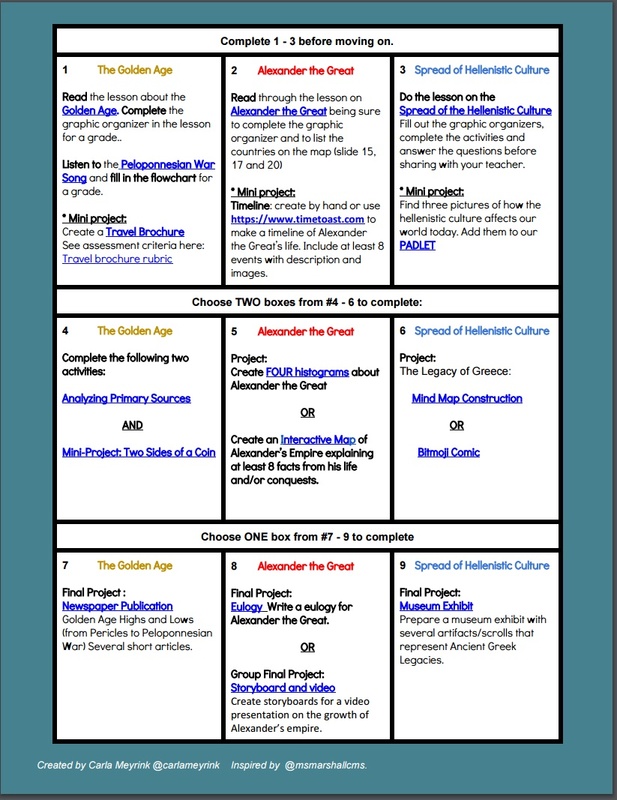 So I decided to give them a whirl and created one for an 8th grade Social Studies class studying Ancient Greece. 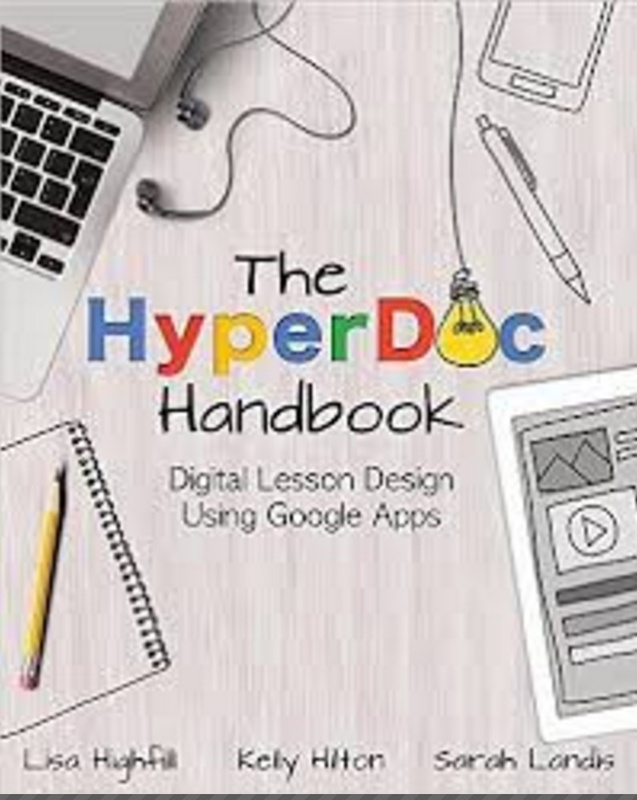 Heather suggested using The Hyperdoc Handbook – an amazing resource that I used constantly while creating mine. I did some backward planning, making a list of standards I wanted my students to meet by the end of the unit. I called on our Social Studies guru, Omaura, to help me find activities that lined up with my goals. 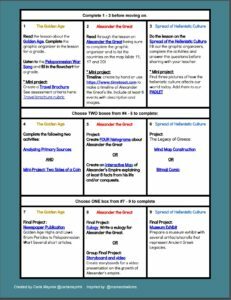 I decided on a format for the hyperdoc: a gameboard style with different levels of learning. I wanted to start with lessons that all students should master to cover the essential concepts of the unit. After that, I wanted to provide students with options to deepen their understanding of the themes that most interested them, in a variety of ways. I started creating lessons and plugging activities into different sections. I arranged and rearranged, playing with fonts and images to make lessons more visually appealing. The hyperdoc allows students to work at their own pace, and everything they need to learn is in there. In class, we discuss the lessons for about 15 minutes before students go off to work on their own or in groups for the next 55 minutes. That leaves me free to meet with the students who need the most help with the underlying skills that I want them to learn: reading comprehension, writing in complete sentences, understanding cause/effect relationships, and making connections instead of memorizing. Some of the projects use technology, others can be made by hand. Students are able to choose the projects that appeal to them most. Creating a hyperdoc was a bit of a challenge – there’s a quite a steep learning curve, but once you get the idea, it’s not so hard. My main concern was trying to produce something that wouldn’t be just a fancy worksheet for students to complete. I also wanted to use technology, art projects, and writing projects to ensure that students could show their understanding through the techniques that they were most comfortable with. Finally, I wanted to make it an interactive document that they could work on individually with little support. I’m not sure if I was successful. Once I try it out in the classroom, I’m sure there will be things I’ll want to tweak and improve on. But, for now, I’m excited to see how this experiment goes! If you check out my hyperdoc, I’d love feedback on how I can improve it. Thank you for sharing your in-progress journey, and kudos for trying something new! I look forward to hearing how it goes in your classroom! Great ! I am working on the same and on the same path. Thanks for sharing your learning experience.